The Tharu people are central to the Chitwan area culture and make up approximately 13% of the 29 million Nepalese population. They are long lasting forest people, they live mainly off the land around them, are very close knit family wise and like all Nepalese they are very welcoming having adapted well to a more open society. Their way of life for so many centuries is said to have made them seven times less likely to catch Malaria, although Malaria in this region is quite rare nowadays. The local guides will probably emphasise their houses are made from Elephant Dung (or as my Guide put it; "Elephant Sheets"!!). In fact the walls are built from a mixture of Dung, Clay, Mud and Grass. The rich brown warm colours this mixture makes along with the thatched roofs makes them quite unique. 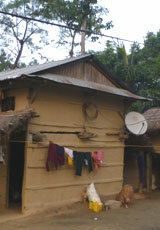 On the 'adapted to modern ways', it is quite amusing to see these houses with Satellite Dishes attached. Telecommunication in Nepal is quite cheap in comparison to some things. As far as I could see Cars are not on their list of priorities, everywhere you go around Sauraha you see them walking along the roads sometimes quite long distances from any houses, some seemed to have Bicycles though. 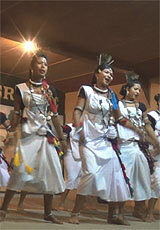 A part of the tourist experience is to attend a Show at the local Community Centre where Groups will perform local Dances. Dressed mainly in white, these are performed to a background of Drums and involve a lot of stick work. It is hard to find more beautifully dressed and attracive girls. 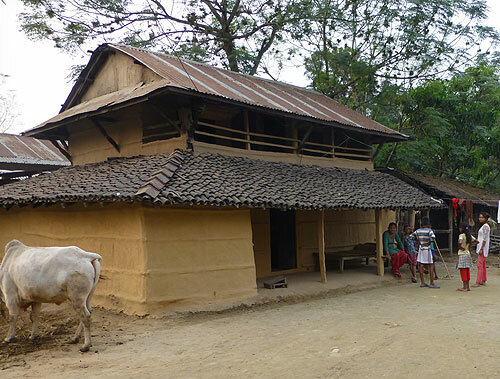 The Tharu people are quite open to tourists strolling amongst their little houses, they won't ask for anything, they just go about their normal daily business. I like to think the Guides and their Companies do financially reward them for this.